"Planetary Healing" - an album of cosmic dimension! The unique "Planetary Suite" is composed and arranged by Margot Reisinger. Eleven planetary sound scapes, inspired by the different energies and emotional qualities of each astrological planet. cast their influence on life on Earth by the sublime force of their radiation. frequency corresponding to the planetary vibrations, Margot Reisinger created a harmonic musical masterpiece. The sound of the Singing Bowls is complemented by violin, piano, guitar, flutes, percussion and background vocals. Each track passionately reveals a strong symphonic vision of the corresponding planet. Poland, adds to the beauty of this outstanding album. A symphony with classical flair created in the Minho Sound Studios. 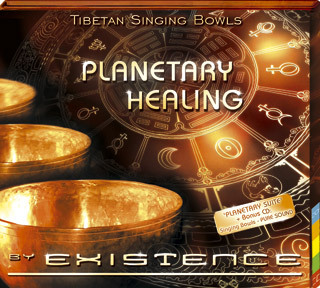 Bonus download - Tibetan Planetary Singing Bowls - Pure sound - is a Bonus CD with high quality recordings of the meditative, pure sound of 58 Tibetan Planetary Singing Bowls. More than 75 minutes of soothing sound for deep meditation and relaxation. A perfect means for Massages, Music Therapy, Sound Healing, Wellness, Reiki- and Healing Treatments, Light- and Energy Work, Aroma Therapy, Yoga, Tai Chi, Qi Gong, Shiatsu, deep Relaxation, Meditation, Religious practice and many others. on this complex sound project. "Planetary Healing" - a musical voyage through the depth of our magnificent solar system.